Flow Cytometry is a laser based, biophysical technology employed in cell counting, sorting, and biomarker detection and protein engineering, by suspending cells in a stream of fluid and passing them by an electronic detection apparatus. It allows simultaneous multi-parametric analysis of the physical and/or chemical characteristics of up to thousands of particles per second. 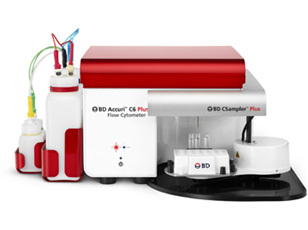 SBH Diagnostics houses a BD Accuri™ C6 flow cytometer to assist us with your research needs and questions. The system is equipped with a blue laser and a red laser, two scatter detectors, and four fluorescence detectors with interference filters optimized for the detection of FITC, PE, PerCP-Cy™5.5, and APC. 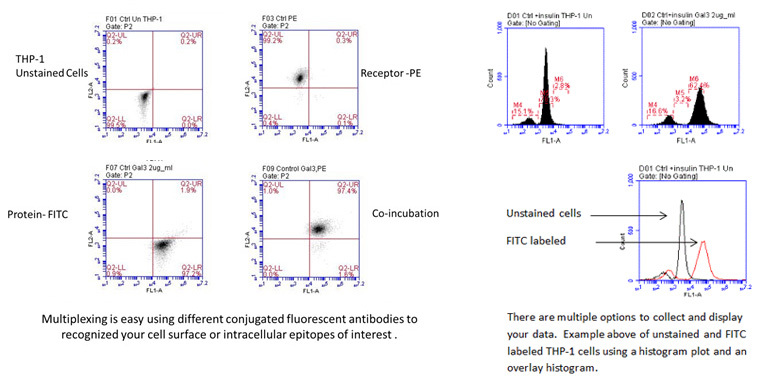 Flow Cytometry can be a useful tool in many areas of research: immunology, cell and cancer biology, and microbiology. Additionally, Flow Cytometry provides a powerful method for investigating cell signaling because the cells do not need to be lysed which is a prerequisite for many techniques. Researchers can first treat cells in a myriad of ways, then fix, stain with conjugated antibodies against cell surface and/or intracellular proteins (permeabilization required), and analyze the cells using Flow Cytometry.